Discover a fun and unique alternative to guestbooks with Graduation Signing Wall Decals! 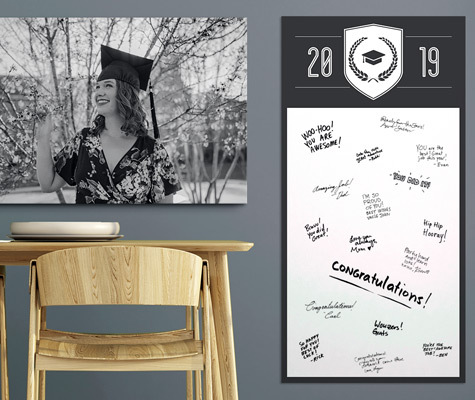 These wall decals are not only stunning wall décor for your graduation event but also serve as a functional guestbook. 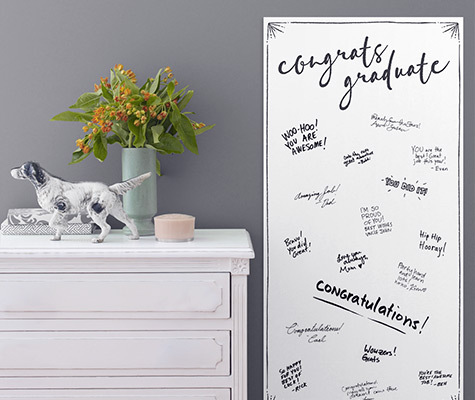 Each panel features a graduation design with plenty of blank space to allow guests to sign and add a personal message. Simply peel and stick to any smooth surface. Graduation Wall Decals are printed on high quality adhesive paper to peel and stick to any smooth surface. Wall decals are easily repositionable and removable without damage to walls or paint that’s been cured for 30 days or more. Leave an autograph or well wishes for the grad directly on the decal surface using the markers or crayons of your choice. Each panel measure 24”x48” and comes in a variety of graduation themed designs. Mix and match with our other Graduation Design products to create a cohesive look for your party.